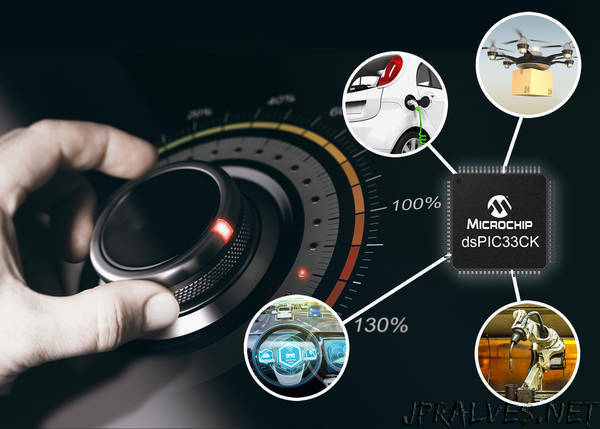 “System designers looking for digital signal processing power with the design simplicity of a microcontroller (MCU) can now utilize a new family of 16-bit Digital Signal Controllers (DSCs) from Microchip Technology Inc. (Nasdaq: MCHP). Designed to deliver faster deterministic performance in time-critical control applications, the new dsPIC33CK DSCs have expanded context selected registers to reduce interrupt latency and new, faster instruction execution to accelerate Digital Signal Processor (DSP) routines. This dsPIC33CK single-core family complements the recently announced dsPIC33CH dual-core family based on the same core.